Landscape industry veterans, including business owners and consultants, came together for ProfitLion’s inaugural Seeds for Success training seminar in Pittsburgh. 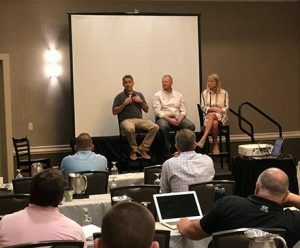 The landscape software company’s July event provided insights to green industry professionals on topics such as marketing, estimating, setting expectations, hiring, sales and leadership. Here are several takeaways shared from a few of the Seeds for Success 2018 presentations. In 2014, Bakhuyzen Jr. phased out of the business operations at Grand Rapids, Mich.-based ProCare, the company he founded. He took an interest in people development, became John C. Maxwell-certified in leadership training and began teaching leadership classes at ProCare. “I felt that it was probably the strongest component we could offer our staff, and build loyalty,” he said. · Pinnacle leaders. These are unparalleled leaders who have reached the peak of leadership (e.g. General Electric Chairman and CEO Jack Welch, Nelson Mandela and Abraham Lincoln). Bakhuyzen Jr. encouraged attendees to understand these types of leadership, examine which level they’re currently on and, from there, how they can build their influence and improve their leadership skills to best benefit their teams. He was engaged in reactive selling. Proactive selling is about sharing your experience with someone who has never heard your story before—even if they aren’t your ideal customer, Bach said. That approach results in building a network of people who might tell your story to someone who may be a potential customer. Engage customers in business discussions. According to Bach, typically it takes 10 leads to get one introduction, five introductory meetings to get two qualified proposals to get one agreement. The difficult part, he said, is getting to those five meetings—which means that the ideal proactive salesperson must have a hunter mentality and the ability to build relationships and build confidence in people. A proactive salesperson also must be able to provide solutions and conduct fair negotiations. Bach noted that proactive selling requires applying the right effort at the right time—for example, having a salesperson qualify the customer and ask relevant questions before sending an estimator to the property. During the “Best Practices for Success” panel discussion, many of the landscape company owners in attendance were looking for guidance on managing the various personalities on their teams—primarily salespeople. As an owner, his responsibility is to keep the emotional and financial matters in check, Miller said, noting that it’s important to get people in the right roles, doing what they’re good at and what they enjoy. Another topic of interest among the attendees was recruiting more women to work in the green industry. Krista Stein, president of Earthscapes in Chattanooga, Tenn., said that by customers noticing her company has hard-working women on its crews and spreading that message through word of mouth, she’s started seeing more female applicants. Jennifer Ford, president of Frederick Mountain Group, a consulting firm based in Jackson, Wyo., mentioned the change that women bring to the green industry. Thomas Noon, principal of Industry Insights, discussed the importance of getting a business valuation. A landscape company owner might decide to undertake a valuation for a variety of reasons, such as having a buy-sell agreement, selling the business, undergoing a merger or acquisition, developing an employee stock ownership plan, planning for succession or determining estate and gift taxes. Noon outlined the basic steps of valuating a business, and explained that a business could be valued high or low, depending on the reason for obtaining the valuation. For estate and gift tax purposes, an ideal valuation is one that’s as low as possible, to minimize tax liabilities. For sales purposes, sellers should be equipped with a valuation showing the highest possible value. For financing purposes, bankers tend to look at a liquidation value rather than a company’s prospects. For litigation purposes, valuations are a “dog-eat-dog” business depending on which side of the case you are on, Noon said. Determining the value of a business is more art than science, Noon said. The process is science because an established set of procedures needs to be followed, but it is also art because the valuation includes measurable as well as intangible assets and liabilities. Noon then detailed how to conduct basic valuations, using three different approaches: an asset approach, which is based on the market value of the company’s assets; an income approach, which compares discounted future income stream to investment; and a market approach, which takes into account the market value of comparable companies. By that math, a seller would want a lower capitalization rate because it would yield a higher business value and a buyer would prefer a higher capitalization rate, which would provide a lower business value. As Noon explained, finding the capitalization rate is an experimental process. You would add up the following percentages: the percentage to satisfy stockholder risk, the percentage to finance the growth of the business and the percentage to offset inflation. Business owners could calculate their values on their own, or they could hire a business broker, an accountant or a professional evaluator to produce the business valuation for them. No matter who performs the valuation or what the valuation reveals, there is one important thing to remember: “The monetary value is what one party is willing to pay, and another party is willing to accept,” Noon said.